If you've been trying to figure out the gap between compact camera and phone camera then DxO One marks itself as one of few viable options. If, of course, you have a recent iPhone to use it with, as there's no compatibility with other platforms. The DxO One is an interesting camera concept, one designed specifically as an add-on for iPhones with the Lightning connector port. The idea is simple: the One delivers the same 1-inch sensor size as found in the Sony RX100 MkIII high-end compact, utilising the iPhone as the preview screen and touch interface, for 20-megapixel image quality with added edge. First thing's first, the DxO One is easy to use. Download the app (also called DxO One), slide open the lens cover to pop out the Lightning connector, then plug the One into iPhone and watch the app auto-launch so you're ready to shoot. Touch-to-focus and shoot using the dedicated shutter button. Simple. But where the DxO One really sells itself is with image quality. Like we say, a large sensor helps to enhance shallow depth of field, so the bigger the better. The 1-inch sensor found here is identical to that of the much lauded Sony RX100 series (the third-generation model) and quality is similarly impressive. Sure, there's some processing differences, but you can save raw and JPEG files and work from those with a much wider palette than you get from just the iPhone's camera. Another key feature is the DxO One has an f/1.8 maximum aperture lens, further enhancing that shallow depth of field. Now f/1.8 might only sound slightly "more" than the f/2.2 of the iPhone, but when dealing with a larger sensor and physical dimensions the results can be seen for themselves. We've shot cocktails in dark bars at four-figure ISO settings without using flash and it's scenarios like this where the DxO really shines. You might not want to use this camera unit all the time, but as an optional, easy-to-plug-in add-on it makes its case in certain scenarios. The DxO's optic, with its 32mm equivalent, is a longer focal length than the somewhere-around-28mm-equivalent iPhone 6S Plus, so things are cropped slightly tighter into the frame. That lends itself better to portrait shots, though, as central distortion is less apparent with subjects close to the lens. There's a lot of control from the app too, including full aperture- and shutter-priority modes, manual and programme auto, or a variety of scene modes. Sensitivity runs from ISO 100 to 12,800, with Hi1 and Hi2 options available. There's even a max shutter speed option (but, annoyingly, no minimum). Perhaps best of all, though, is the integration into iOS. Take a snap and the JPEG is immediately available to share as you would with any iPhone shot - Mail, Twitter, Facebook, back-ups, you name it and you're covered. The raw files, should you choose to shoot them, will be saved onto the microSD card in the DxO One itself (you'll need to buy one of those, but it'll save that iPhone from getting full of pics, especially given its limited on-board-only storage). Then, of course, there's the size: the DxO is fairly dinky. Not tiny, but small enough to sling in a pocket no worries. We've shot it side-by-side with the Sony RX100 (this one the MkIV though) to show the size difference, and interestingly the thickness of the two is similar. That's unsurprising as the sensor-to-rear-optic distance needs to be a given length for a sensor of this size. 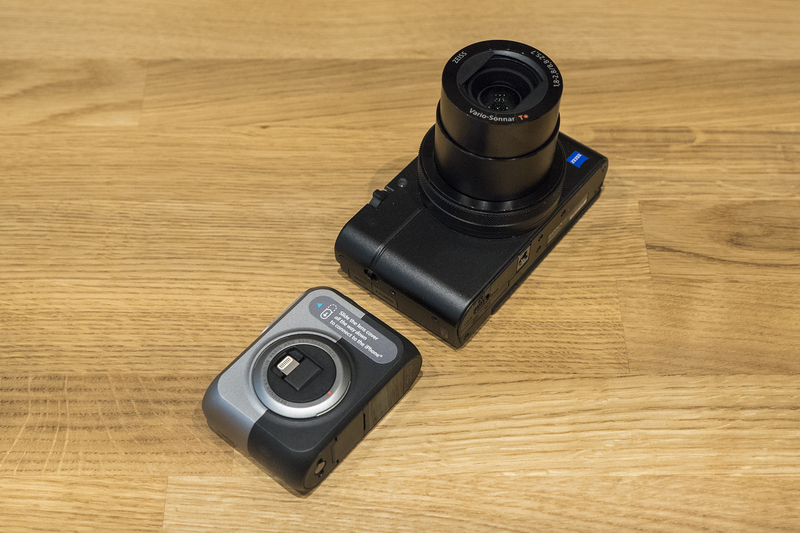 Nonetheless, the DxO is small, pocketable and easily portable. It makes sense. However, it's also rather expensive. At £449 the DxO One is around £120 less than the Sony RX100 III (which has the same sensor) - but that's still mighty expensive all things considered. Think about it: the Sony compact already has the screen, so you don't need the addition of an expensive iPhone; it has an 24-70mm f/1.8-2.8 optic rather than a fixed lens; plus a built-in electronic viewfinder. The Sony is much better value overall. The One's pop-out Lightning connector also isn't covered over, even when stowed, which leaves it prime to dust and grime. It doesn't auto-retract either - and given the intuitive way it pops out ready to be used when dragging open the lens cover, an equally clever opposite for safe-keeping would be great. Better than fiddling around thumbing it back into the unit anyway. And while it's easy to use, the One just is not as quick as firing-up the iPhone's camera, nor picking a fast dedicated compact out of a pocket. We've put it on back-to-front a few times (yeah, so we're stupid, but it can happen), or been caught out by iPhone begging for TouchID or passcode entry before things are ready to be used. When such phone-based interruptions occur there are added issues. Sometimes the app doesn't auto-load and we don't know why, which will leave you digging through screens to find it and open it manually. In addition crashes have happened too often for our liking, with black-out screens or just a freeze - again, no idea why. Some added stability is needed. The DxO One also has its design issues. It's just not as ergonomic as a camera. Using it with the iPhone 6S Plus is a faff because the phone is so large. All too often we'd have a finger straying in the way of the One's lens, because the position of the shutter button seemingly forces hands into such a position. It's finger Twister at times. Another irritation - and this is an Apple stipulation, not the fault of DxO - is that the One can't draw power from the iPhone, instead using its own battery and requiring separate charging. Now there's obviously benefit to having its own independent battery, to avoid draining the iPhone, but when the One runs empty it can't be used - even if the iPhone's battery is full. Annoying. A sleep mode is designed to save on battery drain, but once the DxO One is asleep, it's in a heavy slumber. Tapping the shutter button doesn't wake it back up again: you'll need to fully close the lens and slide it back open before it wants to talk to the phone again. Slow. We also have a major issue with focus point selection. Sometimes a touch-to-position focus point is ignored and the camera instead opts to use another. Which is frustrating, especially as it seems to happen randomly. That's the DxO One in a nutshell. It's small, portable, and as an iPhone add-on (Lightning connector models only) it makes sense for certain photographic scenarios. We've got some cracking low-light and beautiful bokeh in wide-open aperture shots. It's almost like having a Sony RX100 MkIII in the pocket with less bulk and some spare change. However, it's far from perfect. Connecting the unit can slow you down, the app isn't fully stable, we've had some quibbles with focus point selection being ignored or overridden, the physical shutter button's position makes fingers prone to getting in the way, and it's an expensive purchase all things considered. Not that it's without merit: if you've been trying to figure out the gap between compact camera and phone camera then DxO One marks itself as one of few viable options. If, of course, you have a recent iPhone to use it with, as there's no compatibility with other platforms.